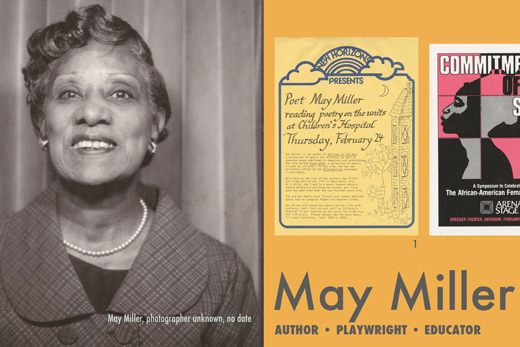 A section of the panel on author, playwright and educator May Miller, from the exhibit "Revealing Her Story: Documenting African American Women Intellectuals," on view through March 9 in the Woodruff Library. In celebration of Women's History Month, Emory's Robert W. Woodruff Library features four exhibits that explore the works of women who have made significant societal contributions. The exhibits draw from and showcase materials from the Stuart A. Rose Manuscript, Archives, and Rare Book Library. "Celebrate Women's History Month" displays original materials from the Rose Library's collections in two cases located on Level 10 of the Woodruff Library. This exhibit features documents, photographs and ephemera that highlight the accomplishments of both individual women and organized groups. The exhibit will be on view through April 2016. The second display takes inspiration from the Civil War-based poem "Native Guard" by Natasha Trethewey, former U.S. poet laureate and director of Emory's creative writing program. The photographic exhibit, entitled "What Must Be Remembered," features vignettes of Civil War-era materials from Rose Library collections, paired with other items reminiscent of the time period. The exhibit makes its debut in the Woodruff Library after previously appearing in Emory's Schwartz Center for Performing Arts. "What Must Be Remembered" will remain on display on Level 3 in the Woodruff Library through mid-June 2016. "Pearl Cleage: A Time for Reflection" was previously displayed at the Woodruff Arts Center through a collaboration with the Rose Library and the Alliance Theatre. In response to the success of that exhibit, Emory Libraries is hosting an encore showing on Level 2 of the Woodruff Library. The exhibit celebrates Pearl Cleage, the acclaimed Atlanta playwright, whose works include "Blues for an Alabama Sky" and "Flyin' West." The fourth exhibit, "Revealing Her Story: Documenting African American Women Intellectuals," gives a peek inside the Rose Library collections of nine African American women writers, teachers, musicians, artists and activists. The exhibit is the culmination of a two-year project that involved the processing of over 270 boxes of materials. The collections offer a chance to explore the experiences and accomplishments of these influential women. Both "Pearl Cleage" and "Revealing Her Story" will be on display through March 9 on Level 2 of the library. The exhibits are free and open to the public during normal library hours; the exhibit on Level 10 is open during the Rose Library's hours.